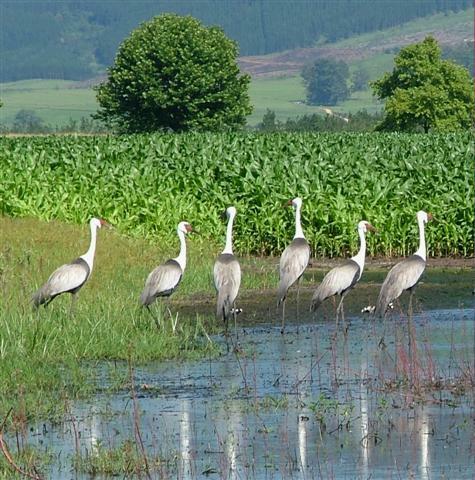 KwaZulu-Natal is home to all three of South Africa’s crane species, all of which are threatened. 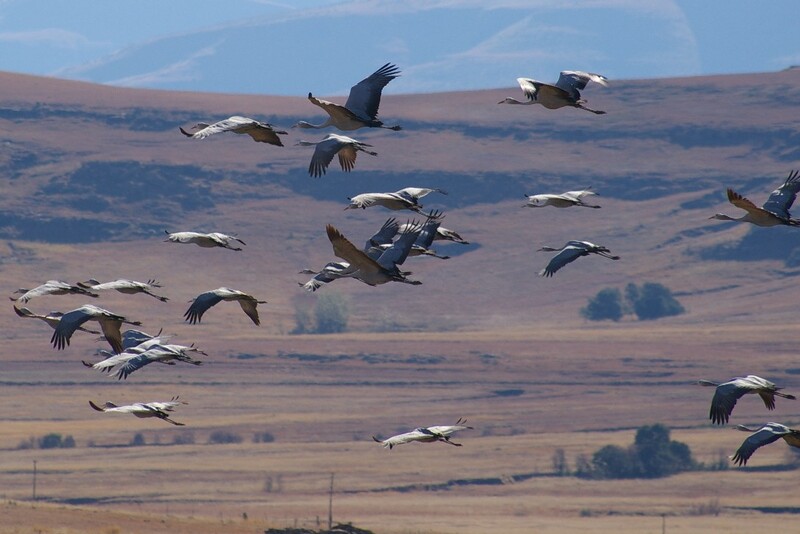 The province has proved to be the stronghold for Wattled Cranes in the country, with approximately 85% of the estimated 250 Wattled Cranes found in the KwaZulu-Natal Drakensberg mountains and foothills. South Africa’s Wattled Crane population is listed as Critically Endangered due to a significant decline in numbers between the late 1970’s and 2000. This same area is also home to approximately 60% of the country’s Grey Crowned Crane population, which is estimated to be between 5500 and 6500 birds. 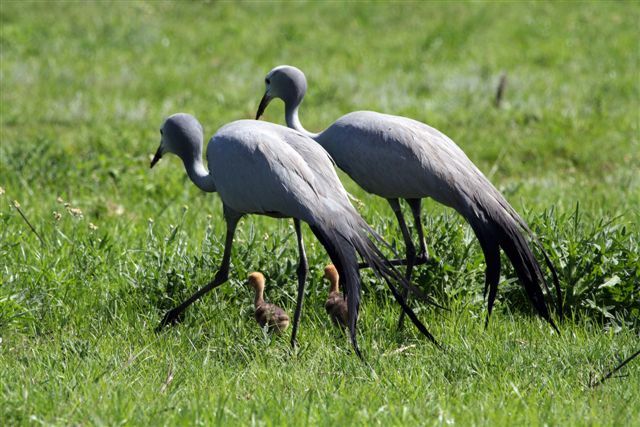 Unfortunately the status of our national bird, the Blue Crane, in KZN is poor as their numbers have dwindled to around 1000 individuals over the last 3 decades due largely to the loss of grasslands within the province. It is for these reasons that 20 years ago, EKZNW initiated a crane aerial survey to take place during June and July annually. This is the peak Wattled Crane breeding season, as well as the time of the year when Grey Crowned and Blue Cranes flock together. The main aims of the surveys are to: # Determine the population size of Wattled Cranes in the province, # Determine the breeding status of known Wattled Crane pairs, # Identify trends in the Grey Crowned and Blue Crane populations, and # Locate Wattled Crane nests with two egg clutches. Each year, the aerial survey totals approximately 25 hours of flying and covers approximately 20 000 km2 over five days. “The information collected over the last two decades has been hugely valuable. It has helped us to monitor trends in crane populations, while also contributing significantly to the development of a viable captive breeding flock of Wattled Cranes that is managed through the Wattled Crane Recovery Programme,” commented Tanya Smith of the EWT. The Wattled Crane Recovery Programme is a national programme implemented by five partner organizations, namely: EKZNW, the EWT, the Johannesburg Zoo, the KZN Crane Foundation and the African Association of Zoos and Aquaria (PAAZAB). The aims of the programme are to prevent the extinction of Wattled Cranes in South Africa by supplementing the wild population with chicks produced from abandoned second eggs collected from the wild, or from the captive breeding flock, and to build a viable captive population. “The aerial surveys allow us to locate nests with two egg clutches, therefore facilitating the collection of the second laid eggs, which are always abandoned by the adults once the first egg has hatched,” continued Smith. 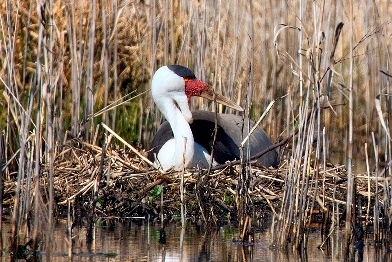 “These eggs are then removed and incubated until they hatch, after which the chicks are hand-reared and integrated into the captive breeding flock.” It is evident from the long-term monitoring achieved through the aerial surveys that the steady decline of all three crane species in KZN, as witnessed between 1970 to 2000, has ceased. 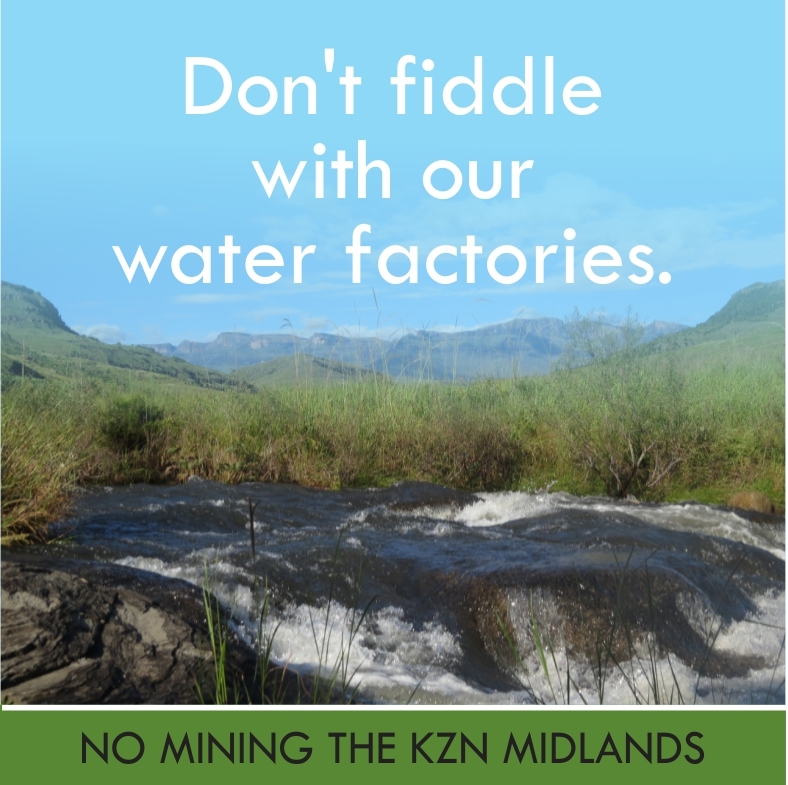 This has largely been due to the efforts of the EWT, EKZNW, KZN Crane Foundation, landowners and other key stakeholders. The EWT strives to ensure the long-term survival of Wattled Cranes in South Africa through conservation in action and has contributed significantly to the conservation of South Africa’s Wattled Cranes for nearly two decades. “We are fortunate to have a committed group of stakeholders in the KZN region who are dedicated to the conservation of Wattled Cranes. The aerial surveys are evidence of all our hard work over the past 30 years bearing fruit and we look forward to further successful collaborations and partnerships in our efforts to save our cranes,” concluded Smith. 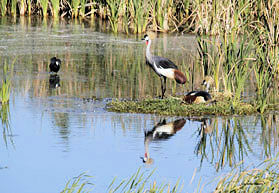 Wattled Crane conservation in KwaZulu-Natal is sponsored by PG Bison and Rand Merchant Bank. This entry was posted in Uncategorized on July 11, 2012 by Midlands Conservancies Forum.